Needless to say – SPOILERS!!! The ‘letter hacks’ pages have a comment from Sina Grace (Editor) noting that there were 12 issues shipped in 2011, which I believe is testament to Adlard and Rathburn’s professionalism and dedication. Kirkman managed to get 12 issues of story out but sometimes (especially in the middle of the year) it felt stretched a bit thin, meandering, nothing to really move the story along. It’s good to see that the final issue of the year comes good, with some sharp dialogue, some movement in the story, and some action – both against undead and living. This issue marks the build up to the ‘larger world’ storyline that is due to kick off in the next few issues, and is probably initiating something that will roll into the landmark issue 100. 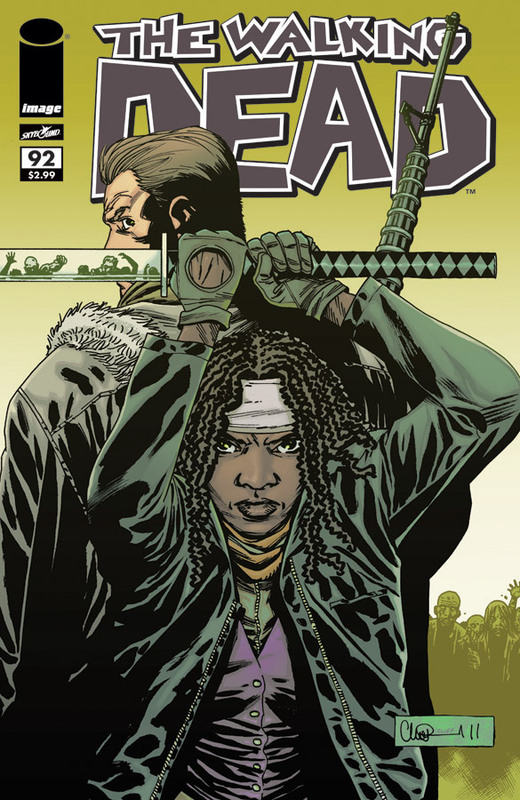 The Abraham / Michonne team-up. The fact that Abraham & Michonne got some decent scenes – they have been sidelined too long. Some decent action sequences, well realised by Adlard and Rathburn. The dialogue – snappy, sometimes funny, but it was always to the point and gave the issue purpose. Less Rick, less Carl, less monologues. An interesting new character introduced, with a great nickname. A fantastic cover – one of the best yet. Issue #92 ends the year in fine style, and sets up 2012 in a good way. I am more excited now about this series than I have been for months.